Here at Manurewa Marae we have fitness classes to suit all members of your Whanau. Whether you like a hearty workout, a fun workout or a relaxed workout we have a class to suit everyone. With an emphasis on whakawhanaungatanga and the inclusion of Te Reo, we aim to get the community active and healthy in a fun and uniquely Maori way. ​Classes are open to everyone, so don’t be shy to bring your Whanau and friends down and get involved! Manurewa Marae offers a unique range of health services and physical activities for our community. Te Manu Aute Whare Oranga - our integrated whanau community health centre offering both holistic and clinical health services within the one whare (facility). 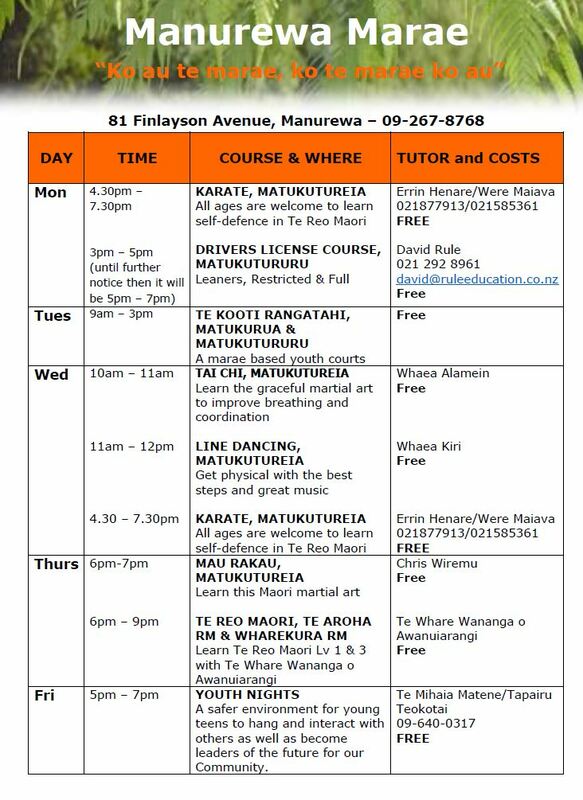 Weekly Fitness Programmes - a safe environment for whanau to exercise with Tai Chi, Line Dancing and many more to come throughout the year.